This is a Functional Outsourcing Business Model. Our Clients are not liable, in terms of Section 198(2) of the LRA and LRAA, and the Deeming Clause is not applicable to Clients. This will allow TPS to become the sole Employer of the Employees Function- which is ring-fenced. To ensure the above is a managed service relationship, all instructions and supervision ofTPS Employees will come from TPS only. TPS will provide the Employees with capital equipment (where required) and do all the development and training of Employees. TPS will manage the total employment cycle from hire to retire, including payroll, HR and IR Function (but not limited to), and source and place Employees. TPS will be responsible for the agreed SLA objectives with the Client. HACCP Compliant Cleaning * Hazard Analysis and Critical Control Point, which is aimed at the prevention of contamination. Project Cleaning, as indicated below. 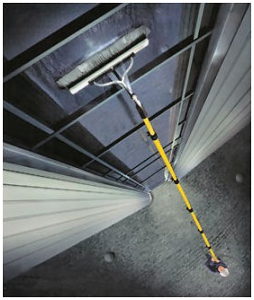 We are proud to announce the launch of our water-fed pole system for cleaning windows. The above Vertical incorporate window cleaners (inside and out) for commercial concerns including office blocks, showrooms, factories, apartment complexes and anywhere else where you have windows. 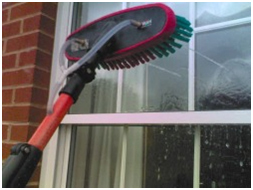 We clean external windows using extendable poles and distilled water. Traditional methods are used internally as required under strict health and safety Procedures. This allows us to provide a professional and cost-effective Service for your business. No chemicals or detergents are used in the process, which is 100% environmentally friendly, providing the perfect solution to “green” window cleaning needs. The two key challenges in cleaning windows are firstly ensuring a great clean without using harmful chemicals and secondly reaching high places without endangering the Temporary and or Contract Employees (Assignees) involved. The way we solve these challenges through our system is by using telescopic poles and purified- distilled water. The purified water has a very high solvency level, and as such grabs the dirt. The brushes on the poles disturb the dirt which is then scooped by the water without the need for chemicals. The dirty water is then rinsed off the windows using additional purified water. Because the purified water has no residue, the windows can be left to dry naturally for a spotless finish. Furthermore, the water is PH neutral and does not attract new dirt as quickly as windows cleaned with chemical agents. Your windows therefore stay cleaner for longer. These specially designed lightweight poles allow us to reach high windows (up to 5 storeys) without the need for ladders or scaffolding. This minimises the risk of injury to our Temporary and or Contract Employees (Assignees), and damage to your property. A thin-bore tube transports the purified water up the poles where it is sprayed through the nozzle at low pressure, so it can be controlled easily. General Pests: Rodents, cockroaches and flies. Occasional Pests: Are “seasonal” pests such as ants, carpet lice, bed bugs, paper lice, fleas and other crawling and biting insects. Stored Product Pests: Beetles, weevils and moths that attack and infest cereal products, dried fruit, chocolate, nuts, rice, grain and spices. Fogging or space spraying treatment: Stored Product Pests and major cockroach infestations. Fumigation: The term “fumigation” applies mainly to the treatment of major infestations in bulk food storage or infested packed foodstuffs, as well as wooden pallets for export and wooden beams in houses amongst others. Soil poisoning: Pre- construction treatment of building foundation trenches and surrounds. Managed by Indgro Multi Services Group™ Recruitment Centre within various operating main centres, which operates as a centre of excellence with the support of national recruitment hubs. Database management, advertising and interviewing. Reference checks, literacy and numeracy testing. Criminal and credit checks utilising the Biometric AFISwitchSystem. Unbiased polygraph and psychometric evaluations.